In low-light or in dark conditions, passengers are illuminated by an infrared LED light and can clearly be seen on the main screen of the infotainment system. 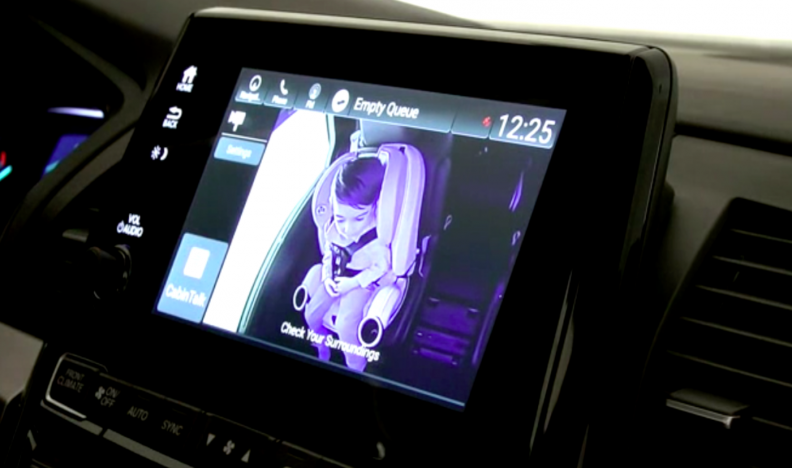 Magna International Inc. has developed a camera that gives parents a view of what’s going on in the back seats of their minivans, a signature feature in the redesigned 2018 Honda Odyssey. The child-monitoring feature developed by Canada’s largest parts supplier provides front-seat occupants a clear view of the seats in the middle and third row on a display screen. A digital, megapixel camera located in the ceiling above the third row of seats provides parents and other caregivers a top-down view of children in both the middle and rear seats. Honda touted the technology but not the supplier when it introduced the 2018 Odyssey at January’s Detroit auto show. In its statement today, Magna touted the technology without mentioning Honda, saying the feature debuted “on a new minivan” at the Detroit show. The 2018 Odyssey was the only minivan to make a debut at the Detroit show this year. Magna said it’s talking to other manufacturers about using the feature. In-cabin passenger monitoring adds to Magna’s list of driver-assist technology. The supplier’s portfolio includes rearview, side-view and front-facing cameras that support features such as adaptive cruise control, collision mitigation braking, 360-degree bird's-eye view and automatic emergency braking. "The in-cabin child-monitoring feature is a great example of how Magna applies technology to meet the needs of specific lifestyles and vehicles – in this case it's families with children and minivans," said Swamy Kotagiri, Magna's chief technology officer and president of Magna Electronics, in a statement. "With today's drivers facing more distractions than ever, our goal is to continue to develop new driver-assistance features to enhance vehicle functionality, improve safety and provide peace of mind."